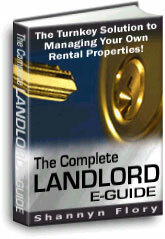 Welcome to the Complete Landlord Guide monthly newsletter. Many changes are taking place at CompleteLandlord.com and we had been working ferociously to get them completed prior to the publication of this newsletter. But alas, I am a perfectionist and am not quite yet satisfied with the latest update of The Complete Landlord Guide and the redesign of the CompleteLandlord.com website. We are also putting the finishing touches on the new Landlord's Resource Directory companion website. For every landlord, each new tenancy comes with risks and rewards. Just as with anything in life, there will be good times and bad and although we can implement ways to protect ourselves from certain hardships, it's important to always be prepared for the worst. Once this is realized and accepted, the difficult times are more easily endured. As I have outlined the prerequisites to becoming a landlord in The Complete Landlord Guide, I hope to realistically illustrate the pros and cons of property ownership and landlording through this newsletter and welcome any comments on topics you would like to see covered herein.